Epica 4-In-1 Hand Blender Just $41.95! Down From $130! PLUS FREE Shipping! You are here: Home / Great Deals / Amazon Deals / Epica 4-In-1 Hand Blender Just $41.95! Down From $130! PLUS FREE Shipping! Don’t miss this deal! Epica 4-In-1 Hand Blender is now offered at Amazon for just $41.95 down from $129.95 PLUS FREE shipping! You’ve taken apart and cleaned your standing blender after every raspberry smoothie. You’ve scoured Amazon for an all-in-one handheld blender solution. And you’re sick of picking out the chunks in your smoothies and soups as a result of inferior blades. And now you’ve found it—the most powerful blender! The Epica is a reliable kitchen friend that makes everything from salsa and guacomole to fruit and yogurt puree a pleasure to create and smooth as silk! It makes a great Christmas gift! 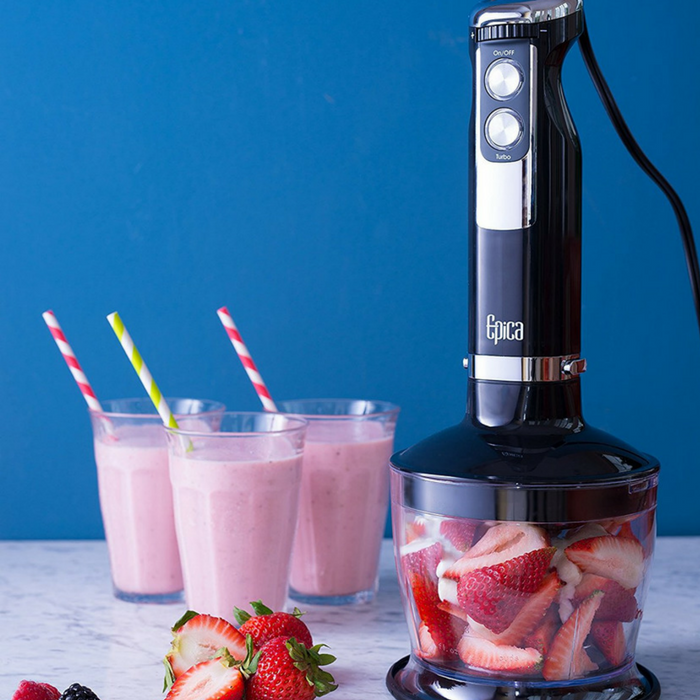 NEVER STRUGGLE WITH FROZEN FRUIT AGAIN: Your old blender’s low-grade blades never stood a chance. The Epica makes a habit of not blending in—this 350-watt workhorse brings you the quickest breakfast smoothies and gourmet soups or sauces at just the right consistency. DESIGNED FOR SIMPLE, POWERFUL USE: When a hand blender is too complicated to use, it becomes a pain rather than a pleasure. With the Epica easy-control design and quick one-click attachment release, your new hand blender will quickly become the best sous chef you’ve ever had. MULTI-SPEED FOR MULTI-TASKING CHEFS: From mashed potatoes to strawberry daiquiris, stop leaving chunks behind in your creations. Using the variable speed dial, adjust this blender’s blade speed for the perfect texture every time—thorough grinding, puréeing, juicing, or chopping. STAY SHARP WITH EASY CLEAN-UP AND STORAGE: This hand blender’s components are all dishwasher safe. Because after crafting natural baby food or perking parents up with a sweet drink, nobody likes dealing with a mess.